This is a drama CD featuring Inoue Kikuko (井上喜久子), Nagai Noa (永井乃愛), Midorikawa Hikaru (緑川光), and a few other seiyuu. This CD is a CC CD (Copy Control CD), and it will not play in certain computer CD drives. Inoue Kikuko plays the role of Minebishi Ryoko a doctor (more of a psychiatrist than medical doctor), and Nagai Noa plays the role of Tanaka Yoshiko a nurse. All of the songs on this CD are full versions, except for Noa's "Hello". "Hello" is only 1:47 long. 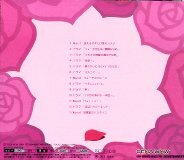 The lyrics booklet contains photos of Inoue Kikuko and Nagai Noa.